The Billionty-Oneth Geek: Shane O'Mac leaves the WWE!!! Shane O'Mac leaves the WWE!!! I know not many of you are fans of wrestling so posts like these are more rare these days. But every now and then something big happens that just can't be ignored. 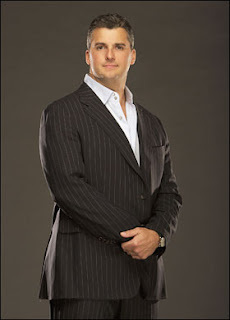 Case in point, Shane McMahon (son of Vincent K. McMahon ie. the mainstream prowrestling tycoon) handed in his resignation letter this past Friday, stepping down as Vice President of WWE Global Media effective January 1, 2010. If you ignore all the death related news stories in the wrestling world, then this is possibly the biggest news in the industry since the death of WCW in 2001. "Why is this important, oh dear Lamster?" so you ask. Well, if anything, it's the symbolic significance of it. Paul Heyman (owner of the original ECW) made an interesting analogy on Wrestling Observer Radio this weekend. He was saying the McMahon's are like the Royal Family of the wrestling world, where Shane would be the prince. His leaving his father's company would be analogous to Prince Charles leaving the Royal Family to do his own thing (not that I know what the heck he does in the Royal Family anyways). Publicly, Vince McMahon has been very supportive of Shane's decision to leave, wishing him well in whatever he chooses to do. But behind closed doors, he's said to have blown a gasket over the whole deal. And honestly, who could blame him. It's like a slap in the face to your own dad. So there's been tons of speculation as to what Shane's going to do after the WWE. Shane has always been a supporter and fan of mixed-martial arts and many speculate that this is the direction he's heading. It's unlikely anything to do with the UFC, but perhaps it's with a smaller promotion like Strikeforce or an even smaller company. Others say he could be starting his own prowrestling company or supporting a smaller company. Personally, I doubt he'll go this route. If he did, this would be like a slap in the face to Vince McMahon, plus a kick to the nuts on top of it all. One common idea floating around is that Shane wants to prove to his father that he too can build his own successful business. The timing of this should also be noted. Vince McMahon was originally handed the reigns of WWF by his father (Vince Sr.) when he was 39 years old. Shane right now is also 39 years old, so perhaps in his head he's thinking that the time is ticking to start his own venture. I think it's a very respectable move by Shane to do what he did. It takes an incredible amount of guts and balls to tell your dad you don't want to be part of his business anymore (and in a position where he was making boat loads of money). Let's face it (I'm telling this more to myself than anyone), the popularity of wrestling is waning as compared to MMA. Times have changed. But right now, no one knows where any of this is heading. Most likely we'll have to wait for the new year (or close to it) before anything solidifies. That is all. It was harmless but interesting right?